Entering our fifth decade of service, we have stayed the course, providing clients with the stability and continuity of care, the hallmarks of service for which we enjoy such renown. 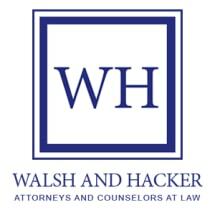 Walsh and Hacker provides risk management counsel and aggressive workers compensation defense to employers, municipalities and their insurance carriers or third-party administrators. We serve clients from the top of New York to the Hudson Valley, and we often venture into other areas of the state as we are consulted for our sophisticated knowledge and impressive results in "workers' comp" law. Due to our client-centered approach and cost-saving strategies, our firm has grown phenomenally over the years. We now employ 11 full-time attorneys as well as a full complement of support staff, to better serve our clients. Walsh and Hacker has served major corporate clients and insurance carriers. You may review a more comprehensive list of representative clients, many of whom have been with our firm for a number of years. While many similar firms experience continual reorganizations and high attorney turnover, Walsh and Hacker has earned a reputation for stability and staff retention. Building on the knowledge that comes through experience, when we represent a client in any workers’ compensation claim or third party claim, we apply all of the skills and resources available to achieve a successful resolution. When clients need information, they receive a clear and concise response in a timely manner from an attorney who is truly familiar with the case. And while our lawyers are tough and aggressive litigators who are able to defend our clients in both state and federal court, we work just as hard to avoid the unnecessary costs associated with litigation, whenever possible. Our reputation as skillful negotiators and competent trial counsel provides the client with a true choice of either compromise or trial, always keeping the best interest of the client at the forefront of every decision. A traditional law firm with modern methods, Walsh and Hacker stands poised to assist clients in meeting the challenges in the 21st Century by employing the methods that have stood the test of time: care, continuity, communication and stability. Contact us online or call 518-463-1269 or toll free 866-240-3041 to arrange for a confidential consultation and case evaluation.